A completely one-sided game in Paris, as France progressed to the semi-final with ease. Didier Deschamps had two players suspended. Adil Rami was replaced by left-footed Samuel Umtiti, who was making his international debut, which meant Laurent Koscielny moved to the right of the centre-back duo. The other decision was more important, however. With N’Golo Kante out, Deschamps selected right-sided midfielder Moussa Sissoko rather than Yohan Cabaye, who would have been a direct replacement for Kante. This meant the system changed from 4-3-3 to a 4-2-3-1 or 4-4-2, featuring Antoine Griezmann just behind Olivier Giroud. Iceland joint-managers Lars Lagerback and Heimir Hallgrimsson named the same team for the fifth consecutive game, in the usual 4-4-2 shape. Iceland’s journey to this stage has been remarkable, but their limitations were exposed here. France were 4-0 up by half-time, and switched off for the second half. Iceland play defensive-minded football with the intention of frustrating opponents, rather than seeking to outplay them. They’re rather lacking in a technical sense but have been praised for their solid defensive play, even if they were the only side to qualify for the knockout stages without keeping a clean sheet. The surprising thing about Iceland’s approach against both England and France, however, has them starting by defending relatively high up the pitch. Against England they conceded a penalty within three minutes when Daniel Sturridge chipped the ball over the defence to Raheem Sterling, in acres of space, and he was brought down by goalkeeper Hannes Halldórsson. Iceland recovered, but it was still a peculiar start against such quick attackers. This isn’t even a particularly compact side, either – you might expect Iceland’s strikers to religiously drop goalside of the opposition holding midfielder, deep into their own half, but this only happens when the opposition have long spells of possession. Iceland again defended high up the pitch in the opening minutes, against the threat of Griezmann. But the extent of their aggressive defensive line was highlighted by the fact that it was Giroud, not Griezmann, who ran in behind the opposition to smash home the opening goal. Giroud is hardly renowned for his pace, but this goal came incredibly easily. The lack of pressure on the man in possession – Blaise Matuidi, in this case – was incredible given the position of the back four, and France couldn’t have wished for a simpler route to goal. Iceland had barely recovered before they conceded a second, Paul Pogba’s header from a corner. 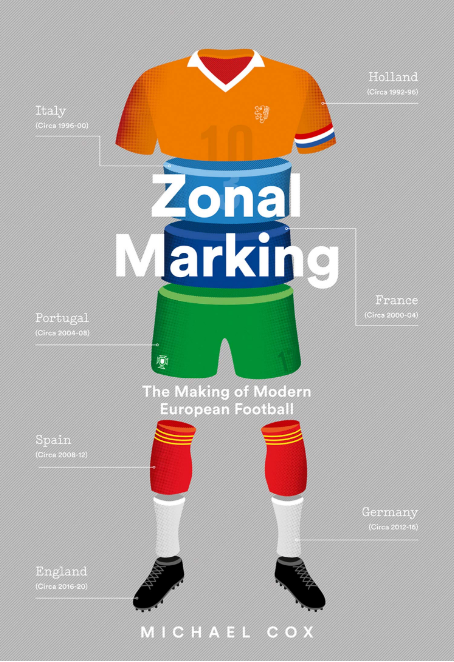 Although Iceland defended this situation poorly, their zonal system shouldn’t be criticised too much: it was their first concession of the tournament from a set-piece, and they’d previously looked very well-organised in this respect, despite conceding more corners than any other side. Faced with overturning a 2-0 deficit, it was obvious Iceland were completely unaccustomed to chasing a game. 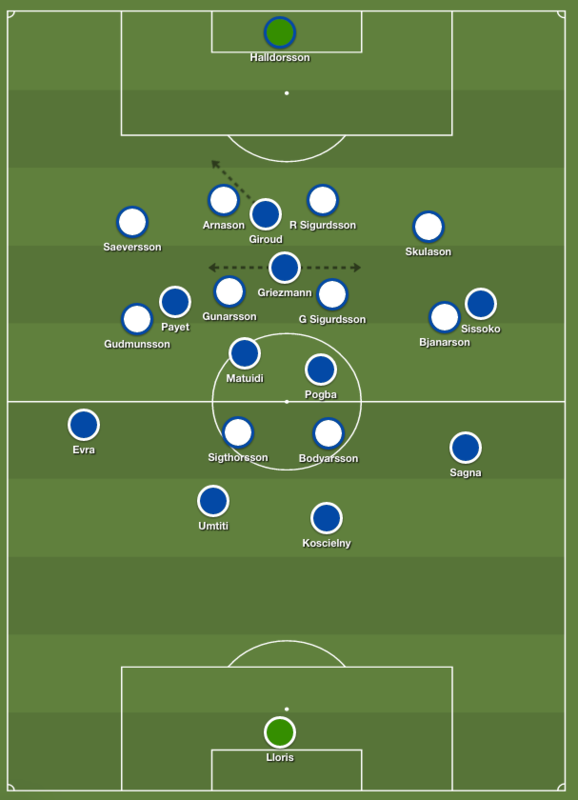 They attempted to keep the ball in deep positions, allowing the wingers time to run forward and support the strikers when Iceland hit long balls, but their passing was often so poor that they didn’t even reach that stage. They turned over possession cheaply, allowing France to win the ball in midfield and break against an open Iceland side, with the wingers high up the pitch, not shielding the back four. France had plenty of time and space to play passing moves, and create chances. Their only promising moment in the first half came from Aron Gunnarsson’s long throw, which almost produced a carbon copy of the goal Iceland scored against England. Their threat in open play, though, was minimal. The change of shape suited France. 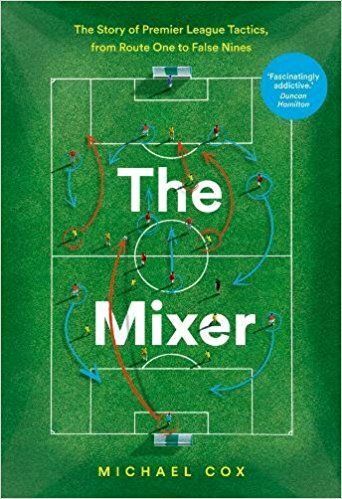 It was in this rough system that they’d overturned a 1-0 deficit against Ireland to win 2-1 – and they could have scored many more in the closing stages. 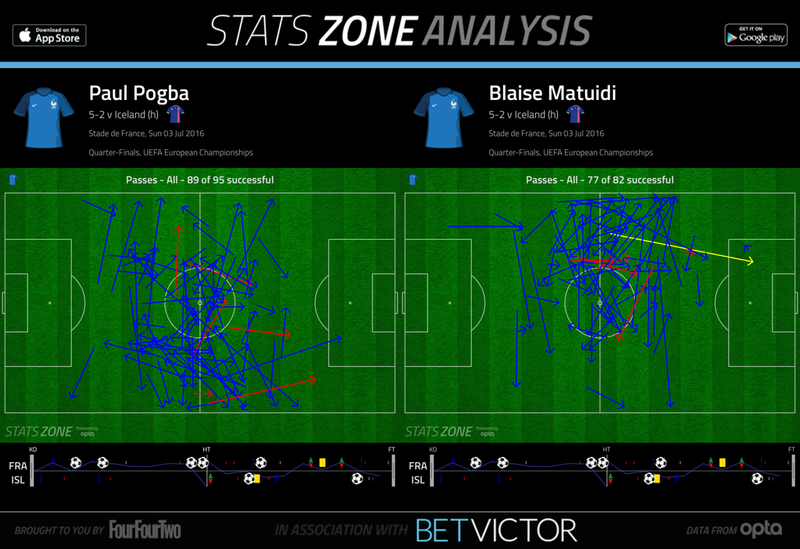 Here, against such inferior opponents there was no requirement for a midfield anchorman, and while neither Matuidi nor Pogba naturally play this type of role, and were forced to curtail their midfield runs, it all came together nicely. Griezmann is happier playing centrally, as he was keen to outline in interviews before this match, and was again excellent – scoring his fourth goal of Euro 2016 to become the tournament’s top scorer so far. In addition to his goal, however, Griezmann’s intelligence in the number 10 role was impressive. He took up very clever positions, received the ball on the half-turn and played as a number 10 as much as a second striker, feeding France’s other attackers. While renowned as a counter-attacking player because of his displays for Atletico Madrid, he’s equally dangerous in tight situations. That changed Giroud’s role, however. In the 4-3-3 Giroud is accustomed to being the only central attacking player, so comes short to receive balls into feet and essentially becomes a playmaker, with his clever one-touch link play. With Griezmann occupying that space he came short in central possessions less frequently compared to the game against Ireland, and spent more time working the channels. 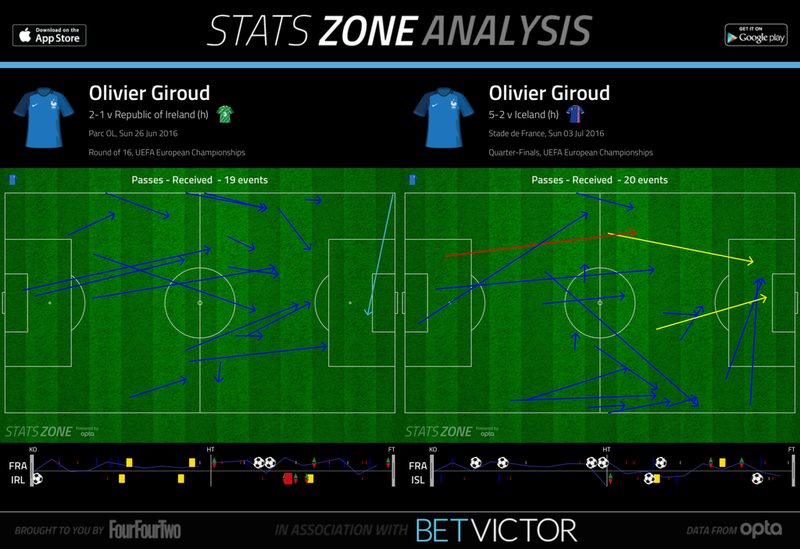 Perhaps it was this tactical tweak which encouraged Giroud to make more runs in behind, as for the opener. He later scored a second goal, a header from a Dimitri Payet free-kick. The second half was a complete non-event. France were simply seeking to conserve energy and removed Giroud and Koscielny, who were in danger of a suspension. Iceland should be commended for their persistence, and for ending a fine tournament positively by throwing men forward into attack. Ultimately, though, they were outclassed. A combination of Iceland’s surprisingly high line, and France’s reshaped system, created Giroud’s opener – and from then, there seemed only one outcome. Iceland tried to push forward more, and attempted to be positive with their possession play, but this simply highlighted their limitations in possession and exposed their defence. Deschamps now has a key decision to make ahead of the Germany semi-final – does he keep this system which has worked so well, or return to the 4-3-3 with Kante in the side? Hello, I don’t want to be dismissive or disrespectfull as your posts are always insightfull. However, it seemed like just an excerpt from deeper analysis. I agree it outlined all the important points but I guess I was spoiled by ZM with more detailed analysis. To be more constructive, I wonder do you think France would still get the same outcome if they didn’t score twice from their first two strikes on goal? Personally, I agree Iceland was defending structurally wrong in sense they were high without pressing the ball carrier, however, they were severely punished which lifted the burden of pressure from hosts and allowed them free flowing game and switch off in the second half. Thanks for awesome analysis of the recent games!